Halfords Yuasa Racing's Matt Neal tallied his second success of the 2016 Dunlop MSA British Touring Car Championship campaign at Oulton Park this weekend (4/5 June), as the Honda Civic Type R proved its prowess as the fastest front wheel-drive car in the field. Oulton Park is renowned as a circuit that favours rear wheel-drive machinery, and with both drivers carrying significant success ballast, Gordon Shedden qualified fifth - less than eight hundredths-of-a-second shy of the top spot - with Neal not far behind in eighth, placing the pairing ahead of the majority of their chief title rivals. 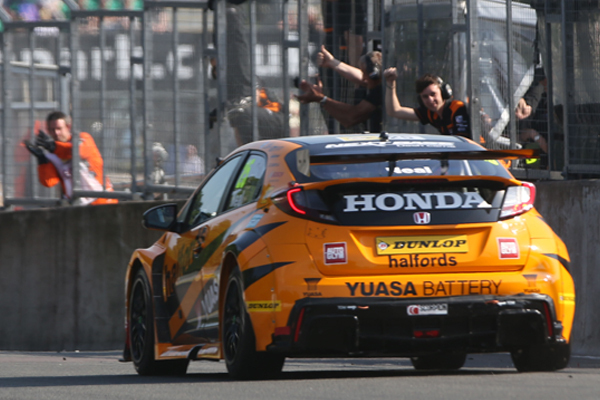 Shedden ran as high as third in the opener, but with his soft-compound tyres fading in the closing stages, he found himself fighting a rearguard battle. Following a valiant defence under persistent pressure, the defending champion ultimately had to concede the position to old foe Jason Plato, taking the chequered flag fourth with Neal ninth. The Scot repeated the result with a solid effort in race two, as Neal emerged from a titanic multi-car scrap in seventh. That saw both Civic Type Rs begin the reversed-grid finale from the sharp end of the order, with Neal leading from lights-out and Shedden working his way swiftly up to second. Thereafter, the duo ran in close formation as they consistently pulled away from the chasing pack, but a late puncture for Shedden dashed a comfortable one-two finish. Neal's dominant victory saw him leave Oulton just one point off the championship lead, with Halfords Yuasa Racing in the same position in the Teams' standings. Honda similarly sits second in the Manufacturers' Classification, with Shedden improving a spot to fourth in the Drivers' table. "It seems to be becoming a bit of a trend at the moment that we run under the radar in races one and two with the weight on-board and then win race three! The ballast certainly hurt us in qualifying and race one, and race two got pretty fraught at times with some really robust driving - we had to battle for every inch of track space. It was nice to have a more straightforward race three, although it was obviously a shame about Flash's puncture because it would have been great to take a one-two finish for Halfords Yuasa Racing. After that, I backed off a bit because we had enough of a cushion behind. I was dead chuffed to get the win - I really don't think I'll ever get tired of that feeling!" "I think it's fair to say the Civic Type R was the fastest front wheel-drive car at Oulton and given the advantage that the rear wheel-drive cars enjoyed, we definitely extracted the most that we could from races one and two. Race three was looking even better and then we got the puncture so close to the end, which was massively disappointing. It came completely out of the blue; there was no tyre drop-off and the car felt fine. In hindsight, given the advantage we had, perhaps we could have backed off a bit earlier but neither of us was taking any unnecessary risks - it was just pure bad luck. Still, we proved once again that we have the pace so we'll put it behind us and move onto the next one."